Great wine is realized at the 3-way intersection of art, science, and hard work. Blending is a medium for creating a wine that is more delicious than the sum of its parts. The reason we blend is to create distinctive wines that are balanced, reflect the vineyard and vintage, and of course, are a pleasure to drink. In the cellar, our winemaker Lisa Hinton and her talented team are careful to preserve the integrity of each lot of grapes and subsequently the wine to preserve its unique personality. Every barrel of wine is much like a puzzle-piece belonging to a beautiful and nuanced landscape -- a single thread woven throughout a brilliant tapestry. 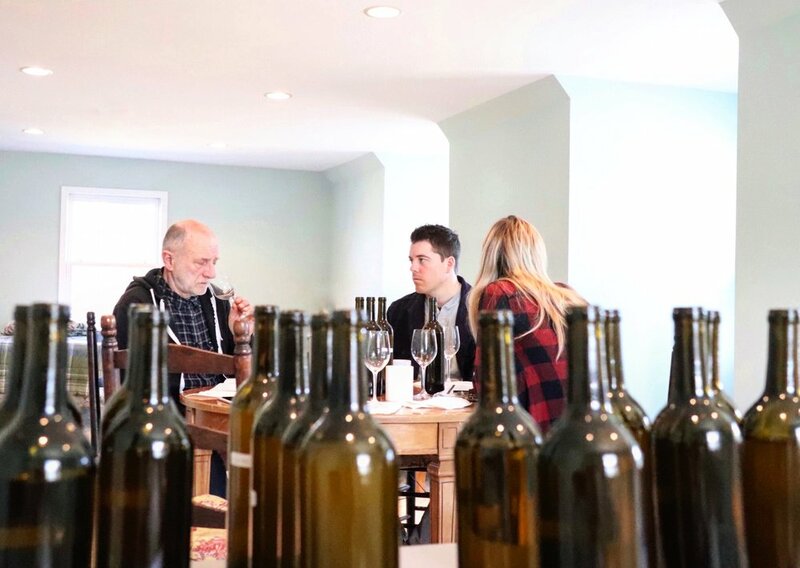 When we sat down to the blending table this past weekend, there were four of us: Lisa, Ashli, Lucien Guillemet (our enological consultant) and me. Lucien is the winemaker at Chateau Boyd-Cantenac, a Grand Cru Classé Château in the Margaux appellation of Bordeaux, France. He visits Maryland twice a year to taste, deliberate, and blend. 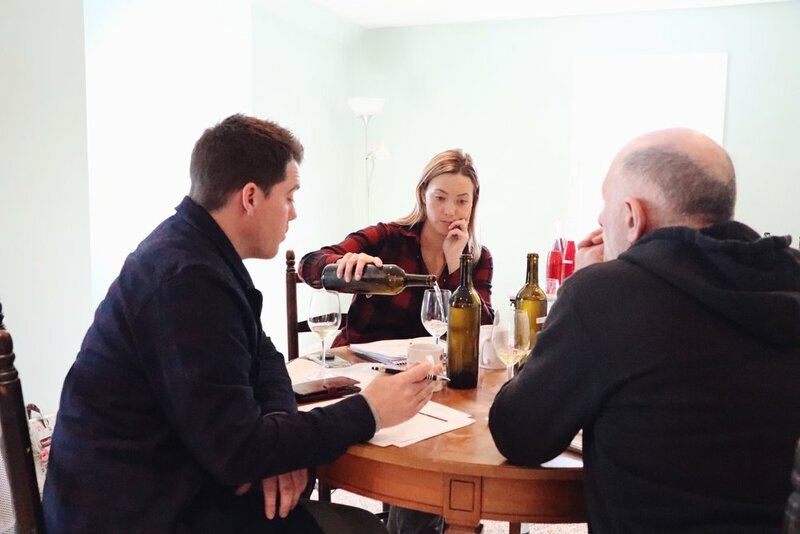 His expertise acts as a sounding board – multiple skilled palates are a key to the successful blending process. Each year we improve individually and as a team. We build on past experiences. We labor over the nuances. We sweat the details. We seek greatness. We taste and reflect on past vintages in a concerted effort to refine a vision for the next vintage. Outfitted with a few wine glasses, a pipette, a graduated cylinder -- and a spittoon -- we set out to assemble our Magnum Opus – our greatest work. We again take detailed notes. We tweak the blend. We ask, "Do you like the direction this wine is going?" We continue to adjust the percentages of each wine in the blend until we find proportions that sing – it’s often quite obvious! For example, Cabernet Sauvignon, Merlot, Cabernet Franc, and Petit Verdot are the usual suspects. These varieties are often blended – each variety bringing a unique characteristic to the table. Blending each of these varieties in just the right proportions is essential to creating truly stunning wines. The blending process isn’t finished until every individual lot has its home in a stunning wine. Rough blends are typically compiled over a few long days. We then revisit these wines over the ensuing weeks, hypothesize, and make adjustments. We then share finished but-not-yet-bottled blends with our staff, friends, customers, and sommeliers for feedback. Over the past five years, we have honed our blending skills and are quite proud of this year’s results. We can’t wait to share the fruits of our labor with you later this spring!